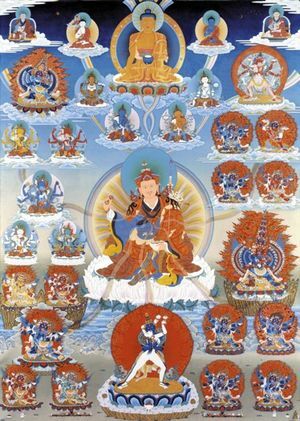 Thangka commissioned by Sogyal Rinpoche under the guidance of Kyabjé Trulshik Rinpoche. Painted by Salga. The Medium Length Practice of Tendrel Nyesel (Tib. ཉེས་སེལ་གྱི་ཆོ་ག་འབྲིང་པོ་; Wyl. nyes sel gyi cho ga ‘bring po) is a terma revelation of Tertön Sogyal. It was revealed at a later date than the original terma revelation of ‘The Profound Instruction of Tendrel Nyesel’ which is the long, elaborate sadhana. There is also another later revelation which is ‘The Brief Practice of Tendrel Nyesel’.